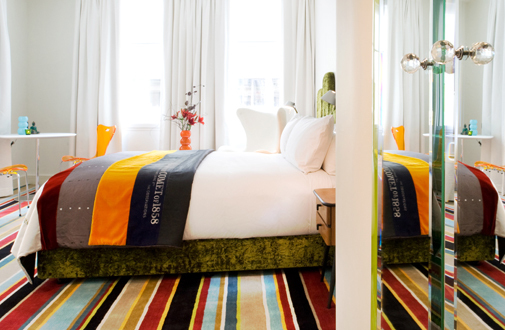 The DeBrett Hotel is located in Auckland, in Australia. 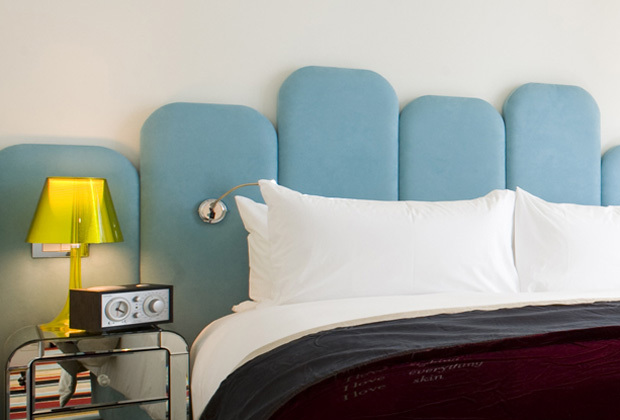 In this hotel each room has its own décor, with colourful furniture and views towards the city. The hotel has 25 double rooms. 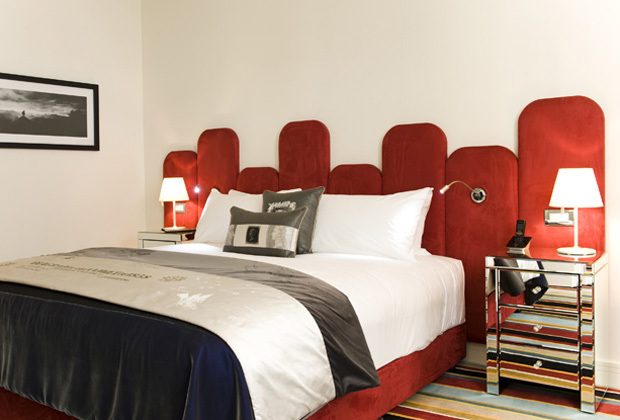 Each room has a double bed, a large bathroom and designer furniture, with art pieces by local artists decorating the room. 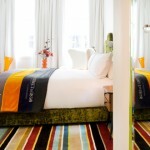 All rooms have a designer carpet designed by Michelle Deary and woven from local wool. The rooms are decorated with traditional local decorations. In each room there is Internet access, an alarm clock, televisions with DVDs, and a minibar stocked with drinks and hand made snacks. Guests will be able to choose their pillows from the pillow menu. Electrical adaptors and iPods docks can be rented at the reception desk. 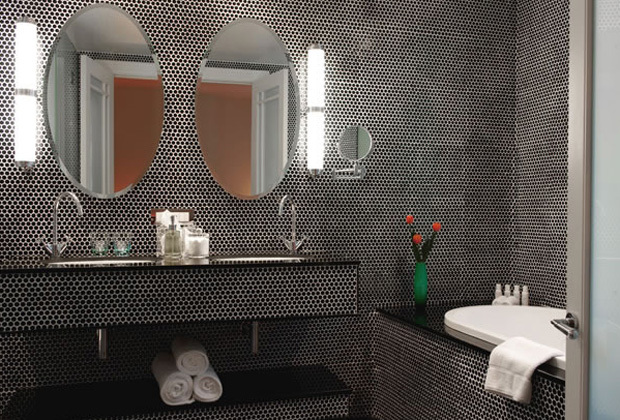 The bathrooms are decorated in black circular tiles, heated granite floors and large mirrors, and there are velvet bathrobes and bathroom amenities for guests. Price includes a continental breakfast and a cocktail before dinner. 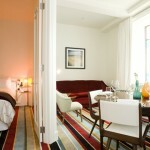 The Classic rooms have views towards High Street, and some rooms have views towards the hotel’s large glass cupola. 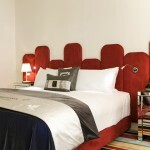 The large double beds have cotton bed linen and hand crafted covers. These rooms have a small living room area with a minibar stocked with local ingredients and a desk and a chair, and some rooms have a dining room. One of the rooms has a large shower, and the other rooms have a large sunken bathtub with a separate shower. 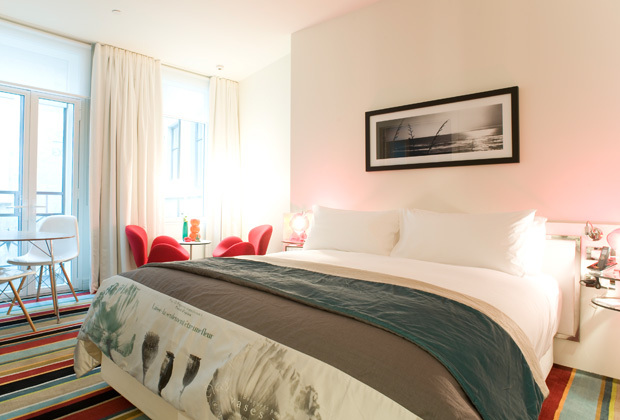 The Boutique Suites are designed for business travellers. These suites have a separate living room which can be used as a meeting room. The room is decorated in many colours. The O’Connell Suites are family rooms. There is a sofa bed in the living room, and the master bedroom, located on the top floor, has a queensize bed, and some rooms have a kingsize bed. There are two bathrooms, a living room with a Playstation 3, baby monitors and a dining area with chairs and a table. There are loft suites with two floors connected by a spiral staircase and loft suites with one floor and a private balcony. These suites have a master bedroom, two bathrooms and a living room with two sofa beds and a dining table. The hotel’s bar is Housebar, which has been renovated recently. The Housebar has a private, guests only hall, and a larger hall with a glass ceiling and a patio for guests and the general public. 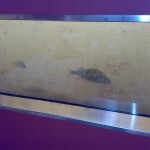 The Kitchen is the hotel’s restaurant and specializes in local and international dishes. The Cornerbar is located a short distance away from the hotel, a bar decorated in a retro New Zealand style where guests will be able to enjoy a wide range of local beers and wines. Guests will be able to enjoy massages directly in their rooms. The hotel has a gym with several personal trainers and yoga trainers. The hotel offers many services to its guests. There are several conference halls equipped with DVD’s, Internet access, projectors and large screens. There is a computer room with a Mac, and there is WiFi in all the rooms. Guests have access to the hotel’s library and media room. The hotel is located in Auckland’s Central Business District. On one side of the hotel guests will find all kinds of restaurants and shops, and on the other side they will find the skyscrapers. A short distance away there are several historical monuments, and guests will be able to visit the Sky Tower, the Auckland Art Gallery and the Auckland Museum. 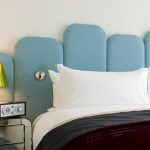 In the last few years, there has been an increase in the demand for themed hostels and hotels. In several countries, ancient prisons have transformed themselves into hostels for the most adventurous guests. Some of the abandoned jails have been remodelled into hostels, hotels and museums. This type of lodging offers guests the opportunity to sleep between bars. The Ottawa Jail Hostel is located in Ottawa, Canada. The jail was built in 1862 and was shut 110 years later. Several decades ago the building was remodelled into a hostel with several large cells, or rooms, that can accommodate groups, and several private cells for couples, the largest of them being the Jailer’s room. The building is built in a Victorian style. There are several types of rooms. The largest cells can accommodate groups and are located in what used to be the jail’s hospital wing. The double rooms are located in the actual prisoner’s cells. The largest room is located in the room where the supervisors worked. There is a small museum, the Carleton County Gaol Heritage Centre, located on the eighth floor of the hotel, a floor which has not been remodelled and where tours telling the history of the prison and ghost tours take place. The hostel has a kitchen with several refrigerators where guests can store their food. The jail’s ancient chapel has been converted into a recreation room with a television, game consoles and board games. What used to be the visiting area is now the Internet room. The hostel is located in the centre of this city. A few blocks away from the hotel guests will find the Rideau mall, Byward Market and several landmarks and museums, including the Museum of Civilization, the Canadian War Museum and the National Gallery of Canada. The Celica Hostel is located in Ljubljana, in Slovenia. This former Yugoslav prison has been transformed into a themed hostel with its own art gallery. 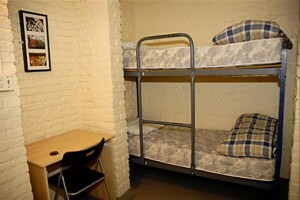 The hostel has 20 rooms, and each room is an old cell. There are several types of rooms. The large cells can accommodate up to 12 people and have a shared bathroom, one bathroom for men and one for women. 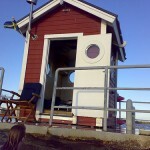 The medium cells can accommodate up to seven people and have their own bathroom. 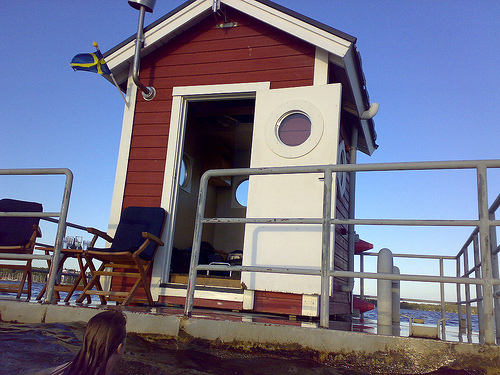 The smallest cells share a bathroom per floor, and have a maximum capacity for three people. Some of the cells have access for people with mobility problems and an adapted bathroom. 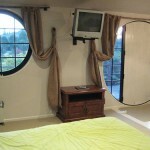 All rooms have the original bars both on the doors and windows. Price is usually up to 28€ per night. There is a kitchen area with several fridges, and a restaurant with hookah pipes. There are safes and a luggage storage area for the guests to use. Books and board games can be used for a small extra price. There are several city and region maps and guides at the reception desk, and city tours can be organized. The interior design of the building is artistic, with many colourful murals and paintings on the walls. Part of the ancient building is used as an art gallery. 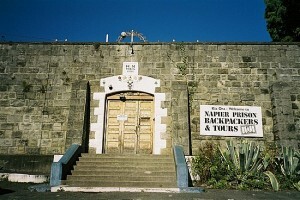 Napier prison is located in New Zealand. The hotel organizes tours around the old jail and the city and group activities, and part of the building has been rebuilt to host guests. Guests will be able to sleep in the old prison cells. Several cells have been remodelled into modern rooms that can accommodate groups, while other cells have become double rooms with a bathroom. 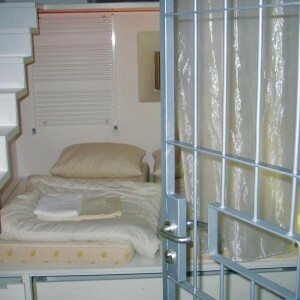 Some of the cells remain unchanged, and the most daring if guests will be able to sleep in these real cells. 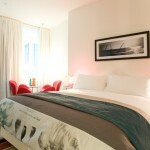 Price for a bed in the large room is 12€ per person, while double rooms cost 15€ per person per night. The Old Jail is a hostel located in Mount Gambier, in Australia. The hostel used to be a jail, and even now the building resembles a prison more than a hostel. 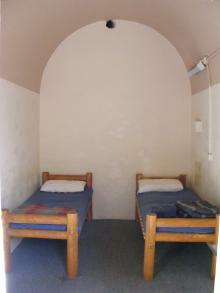 The hostel offers basic accommodation, although they do offer guests a taste of the old jail. Each room is a scarcely furnished cell, and the shower rooms are the same ones the prisoners used. The rooms where the supervisors used to stay are now triple rooms. The only element that differentiates the rooms form the cells is that now the doors can be opened from the inside. Price is between 15.70 and 32€ per night. Despite the very basic accommodation, the old kitchen has been transformed into a renown restaurant. The Turnkey restaurant offers a wide range of delicious dishes and local wines. There is a television room with a pool table, while another meeting room has a fireplace. The hostel’s façade has been restored in order to look like the original 1866 one. 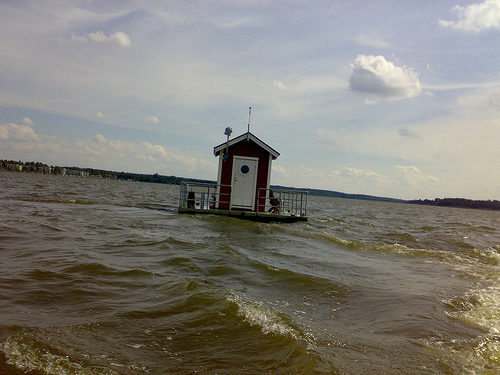 Karosta prison is located in Liepaya, in Latvia. This old military prison offers guided tours around its territory, and the most adventurous of guests will have the possibility to spend a night behind bars. 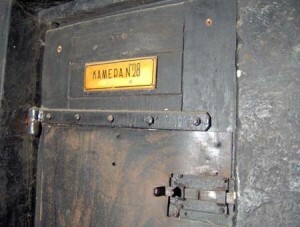 The bravest guests will be able to sleep in one of the cells of this prison, which closed its doors in 1997, and enjoy the same food the prisoners had to eat. For those guests who want to go a step further, the hostel offers the option of sleeping, eating and being treated as a prisoner. Price is 11.20€ per night. Many people choose the latter option as a theme night for stag parties, and many of the fake prisoners even try to escape their cells. The Taylor Falls Old Jail Bed and Breakfast is located in Taylor Falls, Minnesota, in the United States. This small local jail only has four cells and three suites. 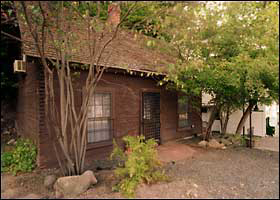 Guests will be able to stay at Jail Cottage, a small cabin that was the main jailhouse. The jail’s façade is made from wooden blocks, an unusual feature in its day. 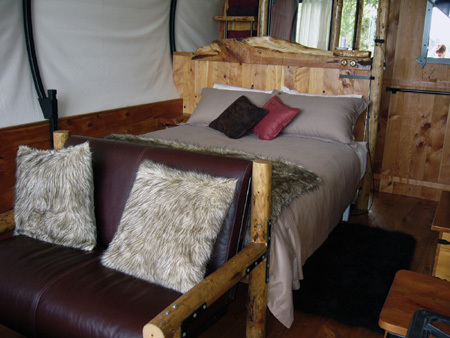 The cabin has several double rooms, each with a private bathroom, an equipped kitchen, a fireplace and a private balcony. When the bed and breakfast was still a jail, a saloon stood next to it, and its building has been transformed into a guesthouse with three suites. 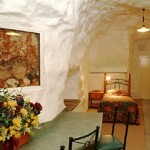 The Cave suite is located inside the original structure of the building. Price is 99€ per night for those who want to stay in the cells in the Jail Cottage, and 106€ per night for those who stay in the saloon. Thorngrove Manor Hotel is located in the hills of Adelaide, in Australia. This high ranked hotel is located in a baroque castle on spacious grounds. The hotel is located inside a large castle with baroque towers, an architectural wonder in itself, and its fairytale façade is one of the highlights of the region. On the inside, the hotel is decorated with many masterpiece paintings and antiques, although technology is carefully integrated in the antique décor. The hotel is the winner of many international awards and is known for its service. Guests will be able to enjoy the tranquillity of the hotel and the paysages, and the hotel guarantees the privacy of their guests. No smoking is allowed at the hotel. 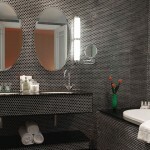 The hotel is an ecologically friendly place where all the bath amenities and the cleaning products are organic. Water is recycled and reused to water the hotel’s gardens, and materials such as cardboard, paper and crystal are recycled. The rooms of the hotel have stone walls with antique paintings, copper decorations and an individual design each. Each of the rooms has a private entrance, and the bed chambers have a large double bed and a bathroom, both decorated and filled with all kinds of amenities. The rooms have a LCD television with DVD, Internet connection and are equipped with many other technologies such as climate control. 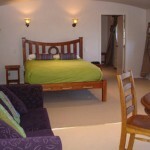 The Tower Loft is an exotic room with a queensize ebony bed. This room is located inside one of the castle towers and can be accessed by a winding staircase. The bathroom holds a large porcelain bathtub and a separate shower. There is a separate dining area decorated with antique furniture and a bronze statue. This room has views towards the hills and costs around 532€ per night. The Castle Chamber is a duplex room where both floors are joined by a winding staircase. This spacious abode has vaulted ceilings, French tapestries and iron engravings dating from the XIXth century decorating the walls, furniture upholstered in silk and a stone fireplace. The master bedroom holds a kingsize bed with a carved XIXth century headboard. The lounge area has high back armchairs, a kitchen and a balcony. 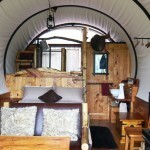 Price is around 678€ per night. Castle Chamber Terrace View is a room decorated as an enchanted forest. 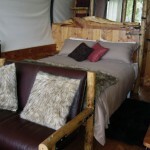 There is a four poster kingsize bed where each post has carved figures of animals and oak leaves. The room has a lounge area where dinners can be organized, and there is an equipped kitchen and a cellar. The room has large windows with wooden shutters, and the price is usually 852€ per night. 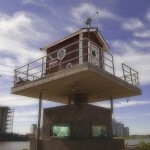 The Observatory Suite is located on the topmost floor of the hotel. A large kingsize bed made of oak stands in the bedroom, which has views towards the horizon. The ceiling in the bathroom, which has a circular bathtub, is decorated with small golden stars. There is a dining and living room with a Georgian oak table, a kitchen and a minibar. The living area has leather sofas. The price of this room, which has high vaulted ceilings and friezes, is 709€ per night. The Queen’s Chamber has decorative tapestries covering the walls, and the room is filled with unique porcelain figurines, an antique clock and a chandelier. The bedroom has a kingsize bed with a headboard decorated with carved lions. All the rooms have windows opening towards the terrace, where dinners al fresco can be organized with views of the hills. Price is 852€ per night. The King’s Chamber is the hotel’s best room. 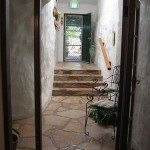 The room has a private parking, and the main private entrance is covered by roses. 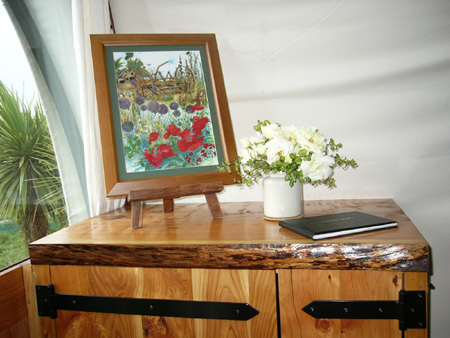 There is a large master bedroom with a kingsize bed and oak wardrobes. The dining and living room is one of the hotel’s best known features, decorated with an intricate fireplace and an ancient map of Germany. The rooms are decorated with antique XIXth century clocks. The ceilings are all vaulted and decorated with golden friezes, and the windows have stained glass. The bathroom has plenty of natural light and views towards a small pond in the private garden. Price for this masterpiece filled room is 1349€ per night. Guests are invited to join a private tea party in the living room. The hotel provides a wide selection of herbal teas accompanied by small sandwiches filled with ingredients such as salmon, turkey, cucumber and berries, and there are plates full of freshly baked cookies and jam and clotted cream scones. The hotel has a well known restaurant where guests can enjoy private dining. It is an haute cuisine establishment catering for the most gourmet palates, where guests will be able to savour organic produce from local farms. Guests staying at this hotel will be able to enjoy massages directly in their rooms. Other on site activities include playing croquet and pétanque on the hotel’s grounds. The hotel is located twenty minutes away from the centre of Adelaide. Less than ten minutes away is Stirling, a small town known for its many theatres and libraries, enough to quench the thirst of the most artistic minds. A short distance away from the hotel guests will find Barrossa Valley, known for it’s vineyards. There are many golf clubs and spa centres nearby. 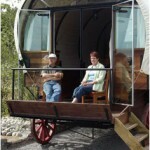 The Wagon Stays Hotel is a hotel where each room is comfortably situated in an old wagon. 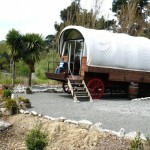 This hotel is an ecologically friendly hotel, and can be found in New Zealand. 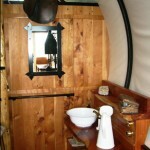 Each wagon is designed and furnished as a comfortable guest room, decorated with ornaments that mimic a more ancient style. However, under the screen of old designs guests will find an array of technologies and other luxurious details. Price per night at this hotel varies between 120 and 160€ according to the season. 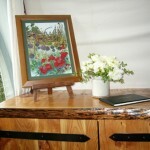 Almost every aspect of this hotel is eco friendly and respectful to nature. The structure of each wagon is made of different types of wood, while the innovative insulating material is made of thick sheep’s wool. All the windows at each wagon are double glazed, and the lamps are low consumer lamps. Most of the electricity used at this hotel comes from the solar panels installed on its territory. 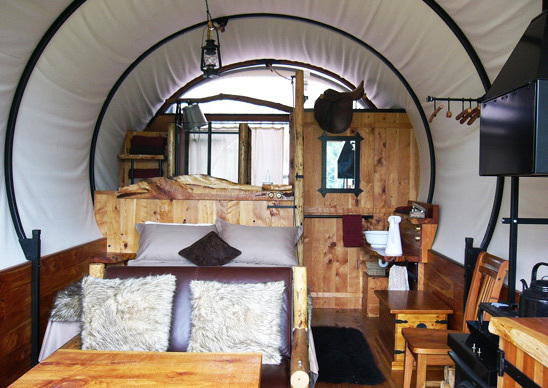 Each wagon has a large double bed, a study sized kitchen with all the necessary equipment, and temperature regulators such as heat pump or air conditioning. Furthermore, each room has its own bathroom with a computer controlled shower. In order to be able to organize and enjoy cozy dinners, the large dining table can be adjusted at different heights, becoming a small coffee table or a large dining table. If guests want to relax, they can watch the flat screen TV or choose between a wide range of DVDs and CDs. Guests are also invited to enjoy free international press, fast Internet connection and telephone coverage. Outside each wagon guests can find an outside private bathtub. Near the bathtub guests can also enjoy the barbecue facilities, although it is recommended to reserve it in advance. Guests staying at this hotel will also be able to enjoy the laundry service. 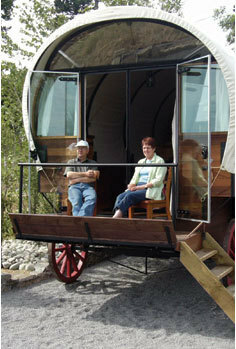 Wagon Stays offers its guests a wide range of complimentary tea and coffee throughout the day. Guests are also invited to try the continental breakfast served at this hotel as well as a delicious organic and ecological dinner. 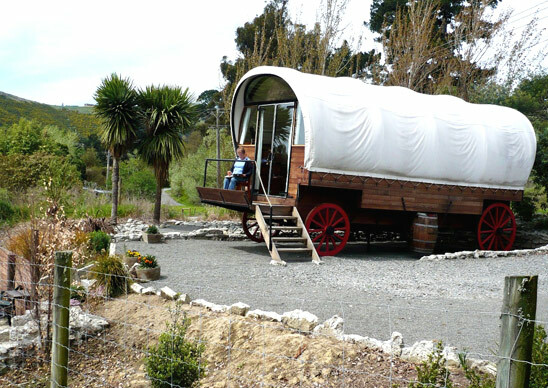 The Wagon Stays Hotel is located in the middle of the countryside, in Cashmere Road, near the city of Christchurch. 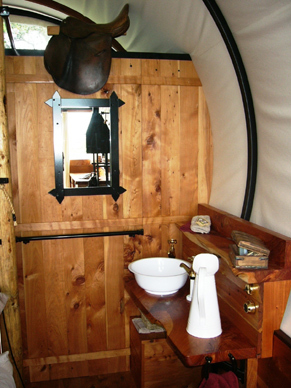 The atmosphere created by the excellent old design in each wagon reminds guests of what the first settlers must have felt upon arrival. The views from the hotel are truly beautiful, with a panorama full of clear country lanes, vast fields and the nearby mountains. 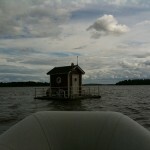 This rather unusual hotel is located in the middle of the Mälaren lake, one kilometre away from the city of Västeras, in Sweden. The Utter Inn hotel is a curious submarine hotel with a rather striking resemblance to a floating aquarium, designed by Mikael Genberg, an architect. 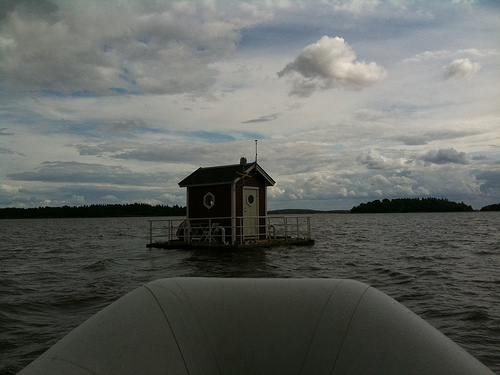 If one decides to stay at this peculiar hotel, they’ll have to take a water taxi from Västeras which will cross half the lake until it reaches a steel platform. 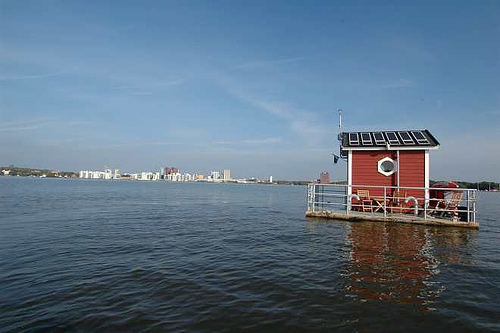 The hotel is built on the steel platform and is surrounded by the small islands peppering the lake, and if one looks at it from the outside, it looks like a small floating cabin. 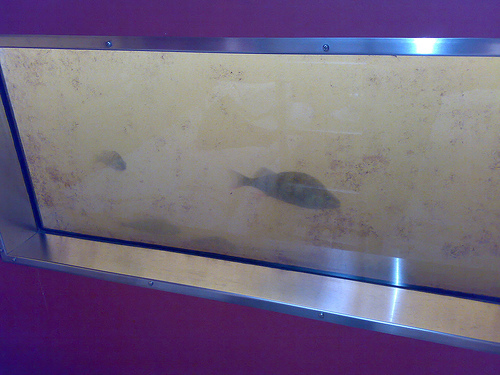 If one goes down the stairs, three metres under the water surface, they will find the only room in the hotel. The Utter Inn has an exterior terrace with comfortable chairs where one can sit down and relax while absorbing the peace of the lake. Inside the cabin, once one has gone through the thick steel door, at three metres deep, they will find the double bedroom. The hotel also has a bathroom, an electric kitchen and a radiator. When one closes the door, they enter a totally different new world, surrounded by silence, tranquility, and the marine lake life. There is a total of four windows, and one can observe the inhabitants of the lake that are floating just outside your window. Price per night is around 165€, and it includes a picnic for breakfast and dinner. The hotel is open from the start of April to the end of September. Most of the furniture in the double room is comfortable and original Ikea furniture, and all the lamps are low consuming lamps. 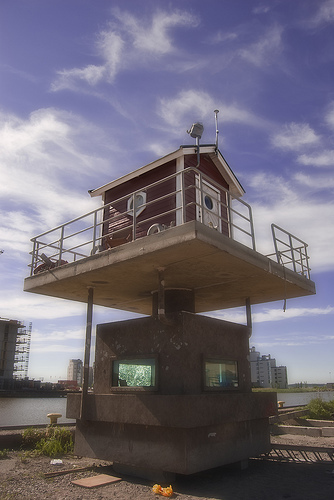 One can swim in the quiet waters of the lake, observe the wildlife around them or be observed by several curious fish that often swim by any of the windows. The star of the lake is a rather friendly luce who enjoys observing humans. 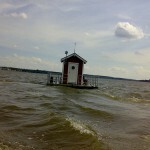 One can also rent a small boat that will take them to the nearest, mostly inhabited, islands of the lake. 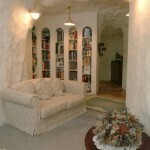 PJ’s Underground B&B is a rather original bed and breakfast. This Australian hotel, located in White Cliffs, is quite unusual in its own way, since it can be barely seen on solid ground. The reason for this is the rather curious fact that this hotel is located under the earth, very close to what used to be old opal mines. Price per individual room is around 60€ per night, up to 76€ for a double room and 200€ for the cottage which can accommodate up to four people. The cottage can also be used as a double room suite, and comes with a fully equipped kitchen, a washing machine and a dishwasher. 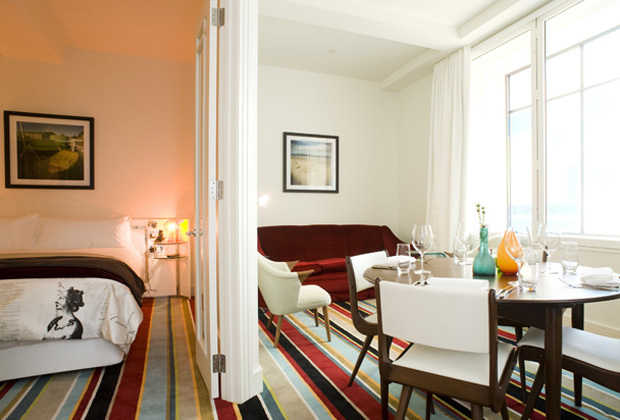 The temperature under the earth is constant, so the rooms enjoy the quite acceptable 22ºC. The hotel is right under the earth, surrounded by 64 million year old rocks, and the walls of this hotel are the white rocks themselves. A tour of the ancient opal mines is included in the price. The hotel, or rather bed and breakfast, also offers excellent breakfasts to all of its guests. The most famous dish is a fruit jam made from the fruit that grows on the trees in the hotel’s own gardens. Anyone who has read the Lord of the Rings books or seen the films knows that hobbits dislike living in tall buildings, and that they prefer to live in wide spaced holes in the earth. 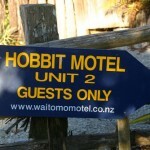 Bearing that in mind, the owners of Woodlyn Park in Waitomo, New Zealand, have decided to create a rather ingenious motel, designed especially for those who would like to live the peaceful live of a hobbit. 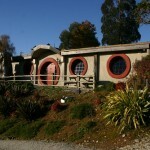 This motel has various hobbit holes, each one with its own kitchen and bathroom. 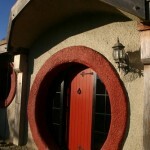 The hobbit holes can fit in up to six people. Both the doors and the windows are round, and the rooms are decorated in soft pastel colors, furnished with comfortable sofas and armchairs. All of this creates a rather pleasant, relaxing atmosphere. 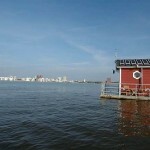 Prices for two people are around 140 € per night, charging 12€ for an extra person. 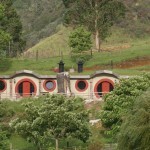 The hobbit holes are constructed right inside the hills, and one has the feeling that they really are in the real Hobbyton or in the Shire.